Artisan Charcuterie & Salumi made with local heritage meat, featuring a specially designed family style menu-celebrating the philosophy of nose to tail cooking. Join Cory Pelan, owner of The Whole Beast in Oak Bay and the team from The Village Butcher. Enjoy two rare breed pigs … the Ossabaw from Edward Tusons farm in Sooke and the Mulefoot from Elderberry Lane Farm on Lasqueti Island. Please bring a wrapped cherished (used) or new culinary book to exchange in holiday fashion. *Dietary requests will be attempted with advance notice, please note that this event is being held in a butcher shop – and may not be amenable to vegetarians. Our last event was beyond a sell-out with over 65 participants, we're pleased to announce a second date for a mushroom adventure with Sinclair Philip and other fungi followers. 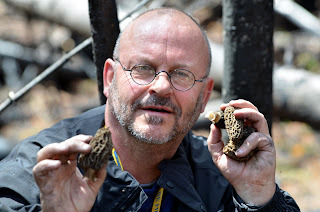 Join us for a fabulous free day of mushroom foraging with Dr. Sinclair Philip from Sooke Harbour House. Learn about sustainable harvesting, mushroom identification, edibility, ideal environments & fungi lore. The day will start at 11 am with a meet and greet at Sooke Harbour House, car pooling and basic plans will be organized together. A presentation with images and mushroom examples may be shown for a quick discussion of basic types, key attributes & mycology 101. Please RSVP for this event – it’s free to Slow Food members and by donation from non-members. Bring your own lunch & beverages, a car may be required for this activity. Join us for a fabulous free day of mushroom foraging with Dr. Sinclair Philip from Sooke Harbour House. Learn about sustainable harvesting, mushroom identification, edibility, ideal environments & fungi lore. The day will start at 10 am with a meet and greet at Sooke Harbour House, car pooling and basic plans will be organized together. A presentation with images and mushroom examples may be shown for a quick discussion of basic types, key attributes & mycology 101. Please RSVP for this event – it’s free to Slow Food members and by donation from non-members. Bring your own lunch & beverages, a car may be required for this activity.